Business is about people; surround yourself with phenomenal human beings. We are building a community here, communities are needed for humans to survive. We stick together and grow as one. We believe that human interaction is needed for our members to have the best possible start in their business and grow their brand. All our members are hungry. Don’t throw us a Five Guys Burger, we mean we are all hungry for success. 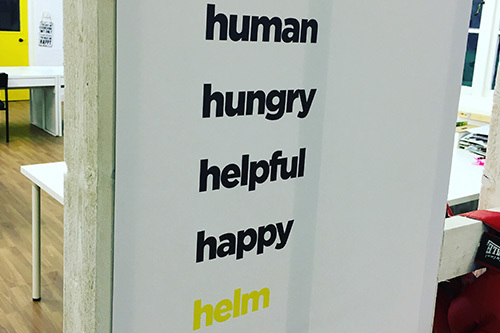 Helm offers an environment where passion and desire meet drive and focus. Mix all four and get hungry to make it happen. We expect all our members to be helpful. Someone helps you, help them back. Pay it forward. Be happy. You are on an extraordinary journey, self employment and entrepreneurship is an achievement to be proud of. Be happy that you can create your own extraordinary life. It’s not going to be easy but it sure is fun. Ready to become a Helm member? Join.